It’s only for flexible people. It’s just a series of weird stretching poses. It’s an activity where my super cute yoga pants are acceptable. This sutra deals with one’s ethical standards & sense of integrity. It’s how we conduct ourselves in life. The second limb, is all about self-discipline and spiritual observances. Asanas, or postures, is what are most familiar to Western Civilization. In the yogic view, the body is a temple of spirit. Through the practice of asanas, we develop the habit of discipline and the ability to concentrate, both of which are necessary for meditation. The 4th stage consists of techniques designed to gain mastery over the respiratory process while recognizing the connection between the breath, the mind, and the emotions. Pratyahara, the 5th limb, is withdrawal. During this stage, we draw our awareness away from the external world and outside stimuli. Dharana is concentration. We learn how to slow down the thinking process by concentrating on a single mental object. Dhyana is Meditation; the uninterrupted flow of concentration. Dhyana is ultimately a state of being keenly aware without focus. Samadhi is the ultimate state of Meditation. It is a state of ecstasy, where the mind and soul are at equal balance. Some refer to this state as “enlightenment” or “becoming enlightened”. The first couple of times you try Yoga, you may not notice a difference physically or mentally. It really takes practice and perseverance, not only in the Asanas, but with your breathing, and all of the mental aspects of the 8 Sutras. When I practice regularly, really try to focus on living in the present moment, and use meditation as a tool to quiet my mind, I feel nothing but love. Love for you, love for the universe, love for the sweet little birds singing in the trees… That’s what we’re supposed to feel, right? For most of my life, I have always had self-esteem and self-confidence issues. I think that’s true for most women in this day and age. With movie stars and models in all of their presumed “perfection”, flashed in our faces constantly, there is such a high standard that we feel like we have to meet. I’m tiny, I’ll blind you in the sunlight, I have super long monkey arms and legs, I have a birthmark on my forehead, I have freckles… For years, all of these things bothered me and I would do my best to disguise what I could. But now, on my path to enlightenment, I embrace all of these things because they don’t define who I am. Our physical appearance will never be “who we are”. When I was a 5 year old little girl, I was Casey… Now that I’m 33, I am still Casey, even though I’m taller (not by much! ), with shorter hair, and a lot more freckles. I wasn’t any more Casey back then than I am now. Why? Because my soul…my consciousness is who I am…not the shell that I’m residing in. 4. POSITIVITY BEATS NEGATIVITY . When I’m on my yoga mat, focusing on my breathing and feeling that life-force pulse through me, negative thoughts never seem to arise. That’s because my mind is focused and not wandering. 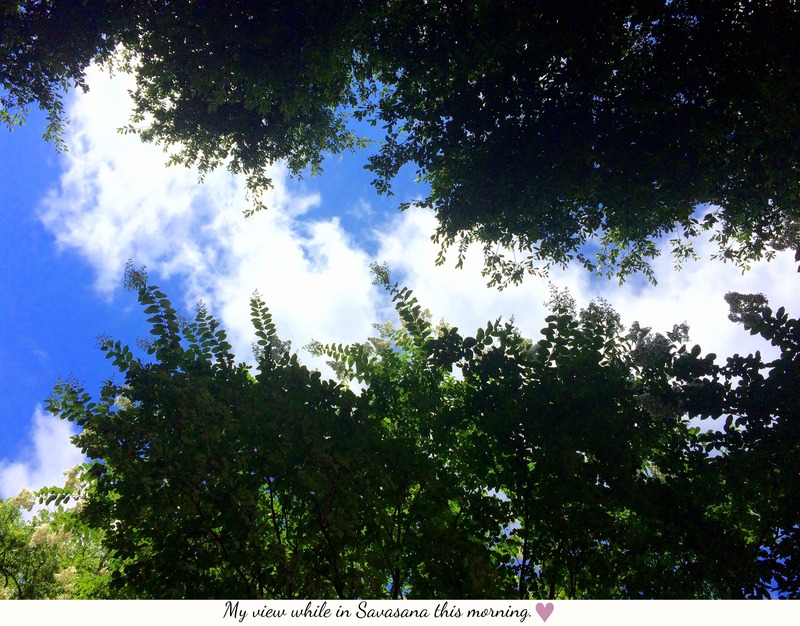 As I lay in Savasana, I focus on something beautiful, whether it be a rainbow, sunshine, flowers, the love I have for everyone, and nothing but positive feelings flourish, and it just sets my day for one of positivity and peace. Positive brings positive… Negative brings negative… I think I’ll just keep on doing yoga and cash in on the positive. 5. LIVING IN THE PRESENT IS THE ONLY WAY TO GO. I’ve practiced the Western idea of yoga for about 9 years, and by this I mean, learning and practicing the asanas. For about a year out of those 9, I’ve REALLY been practicing yoga. I’ve worked on trying to apply those 8 Sutras and become more mentally and spiritually involved with the process. I was like many others in those first 8 years, because I thought it was just about breathing and poses. Now that I’ve educated myself, and have been applying all of those other aspects, I can say that I’ve never “lived in the present” as much as I have been lately. I used to worry about everything, and I mean EVERYTHING! But, when you live in the present, YOU…DON’T…WORRY. Why? Because you are focused on what you are doing at this very moment. You’re not thinking about past events, or worried about the future. I’m sure everyone knows someone or has read a story about someone that died suddenly or way before their time. That’s the truth of life…that we will all die. Whether that be today, tomorrow, or 50 years from now. Since we don’t know when that will be, why not live our life in this moment, since it’s right in front of us. There’s no need to waste time when we can just be happy now. It really makes you appreciate everyone in your life more, you love more deeply and live more happily. The humidity has not stopped my fearless Bootcampers from bringing it, and giving it all they’ve got. I’m always so proud of their dedication and motivation! 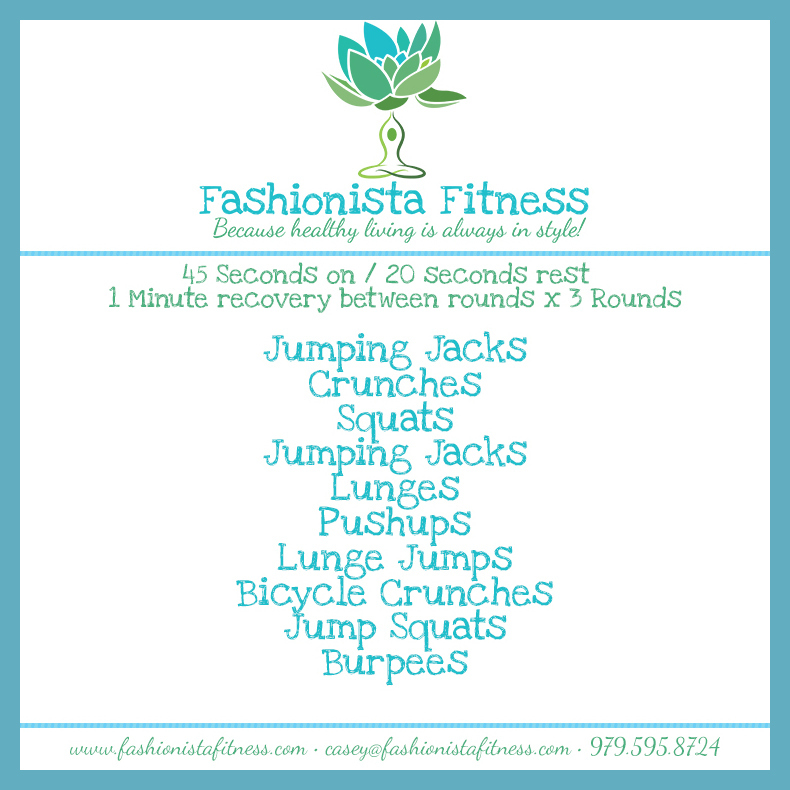 They’re the best…and if I’m late posting their Fit Friday workout, some of them actually ask for it, which is awesome! So…here it is! 🙂 Have a great weekend everyone! Sunday’s are Waffle days in our household! Why? Because they are delicious, crunchy on the outside, chewy on the inside and packed full of protein! In a small bowl, mix together the dry ingredients (first 9). Pour the coconut oil and almond milk together in a microwave safe bowl, then microwave for 30 seconds. Add the coconut oil and milk mixture, along with the bananas and egg to your dry ingredients. 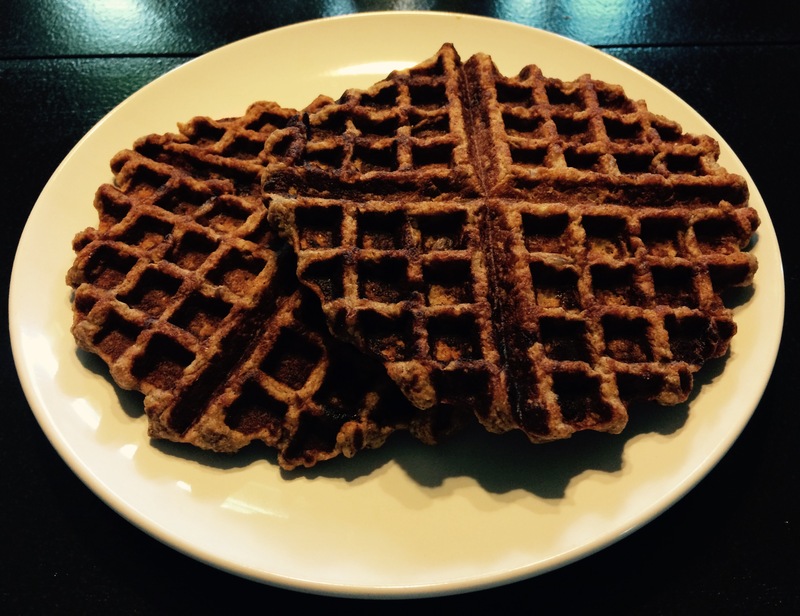 Mix well with a spoon and let the batter sit while your waffle iron heats up. Once your waffle iron is ready, pour batter on using 1/3 measuring cup**. The batter will be sort of thick, so using your spoon, spread it out some over your waffle iron. **Amount may vary depending on the size of your waffle iron. As they are ready, place them on a metal cooling rack stacked on top of a cookie sheet. Be sure that none of the waffles overlap. Once they are all done (should make about 6), place the cookie sheet in the oven and let them bake for about 7 minutes. Take them out of the oven and serve immediately. A LIGHT drizzle of pure maple syrup, honey or agave may be used on top. 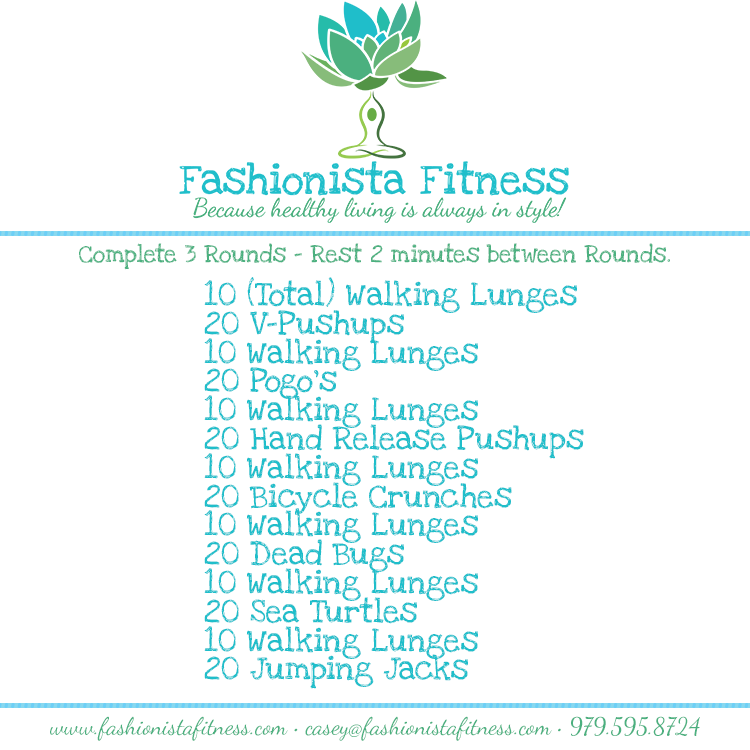 Tomorrow is Friday, so you know what that means…another Fit Friday Workout! Remember to warm up before you get started and cool down when you’re done! 😉 Have fun! Mix together peanut butter, maple syrup and coconut flour in a small bowl until it’s blended well. Roll into small balls, shape into patties, or use a candy mold. Place them into the freezer to set. 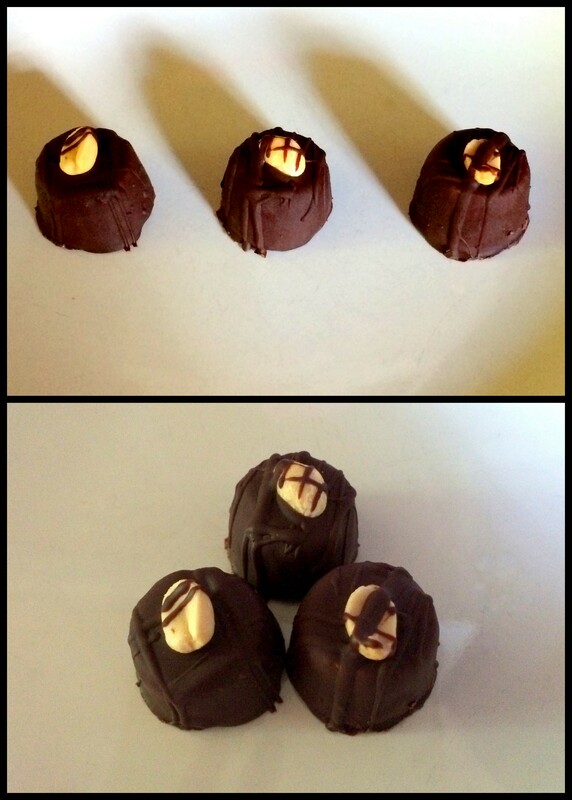 Break chocolate squares into small chunks and place into a microwave safe bowl along with the coconut oil. Microwave in 30 second increments until chocolate is melted. Place onto a plate covered in parchment paper. Put them back into the freezer for several minutes to set. **After they set in the freezer, I’ve found that it’s best to transfer them to the refrigerator, as it will keep the center from hardening too much. 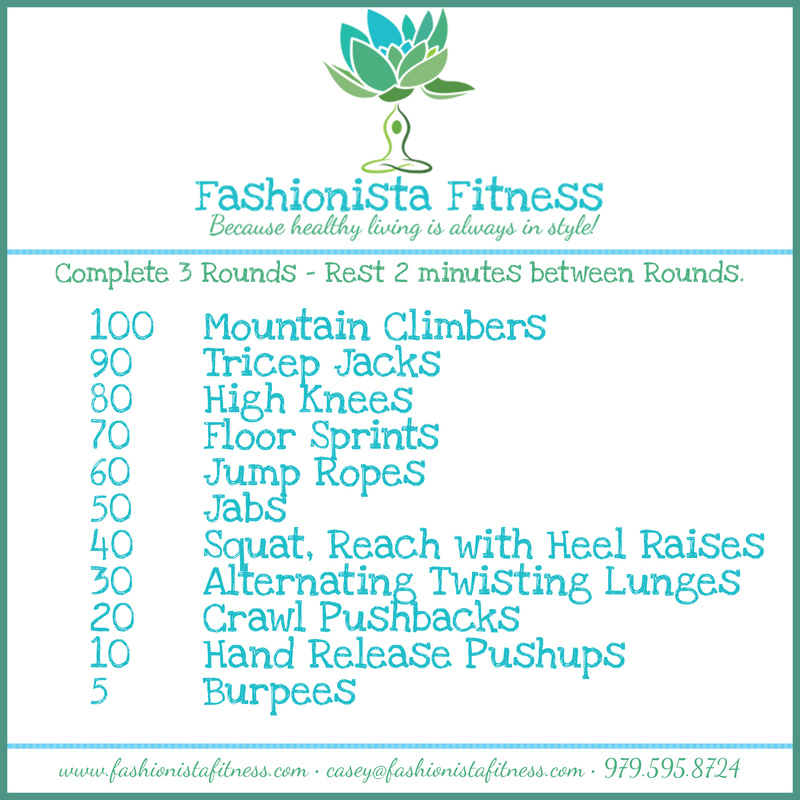 Your Fit Friday workout for 6/5/15! 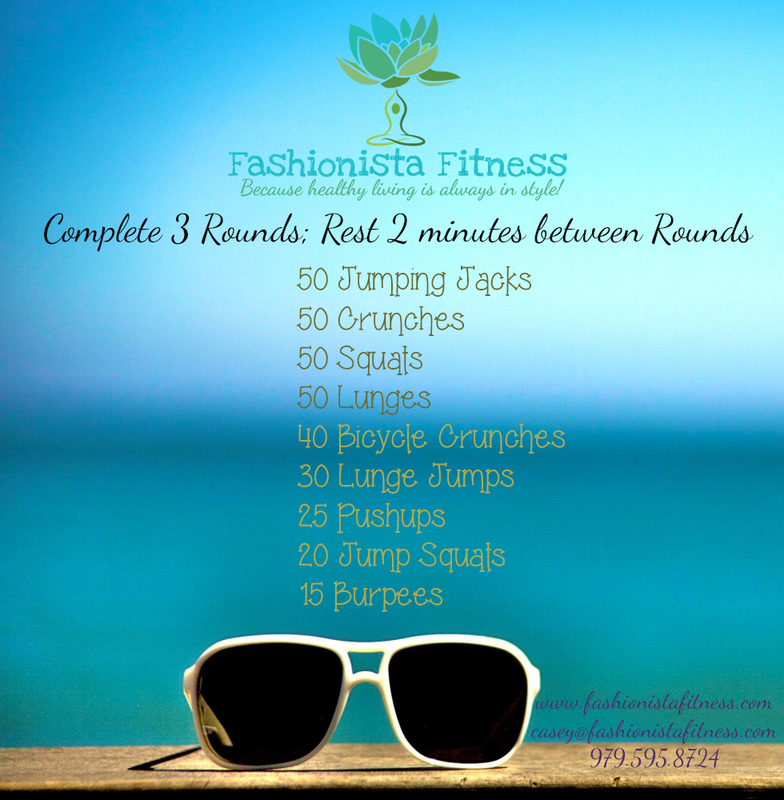 Time yourself each round and try to go a little faster each time to really get a good cardio workout. 🙂 Have fun and remember to warm up first and cool down afterwards.